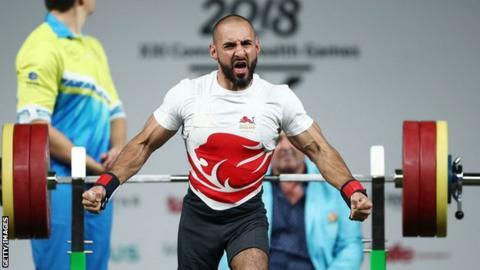 Rio Paralympic silver medallist Ali Jawad has been added to GB's squad for the World Para Powerlifting World Cup after Crohn's Disease nearly ended his career. The double amputee had been restricted to "increasingly sporadic competition" since 2016, when his condition flared up, ParalympicsGB said. He is known for colourful celebrations, which have gone viral on social media. "Looking forward to making my comeback after a very tough year fighting my health," Jawad said on social media. Jawad says he was diagnosed with Crohn's Disease, an inflammatory bowel condition, on the eve of his Paralympic 2008 debut in Beijing, where he competed but finished ninth. He told the BBC Ouch podcast last year that he retired soon after aged 19 and in 2010 had major surgery but "decided in my head if I survived it I was going to go for 2012". Five months later he finished fifth in the Delhi Commonwealth Games, which he describes as "completely nuts", and then came fourth at the London 2012 Paralympics. But he says despite managing his condition, it flared up after winning -59kg silver at the Rio 2016 Paralympics, adding he had been "battling it since". "Last year  was a very bad year: bed ridden for most of it, in and out of hospital, not training, not competing. "So, in October I think I relapsed again and my chance of going to the Commonwealth Games were pretty much out by then." However, he went on to win Commonwealth -54kg bronze on the Gold Coast six months later in April 2018 - with his celebration shared widely on social media. In May 2018, Ali Jawad won gold at the World Para-powerlifting European Championships. "The 30-year-old has long stated his lifelong dream of becoming a Paralympic champion," ParalympicsGB said. "But the road to Tokyo is precarious, with flare-ups in his condition leaving him toeing a fine line between glory and a career-ending procedure." Jawad was named in the squad for the World Cup in Eger, Hungary, in July alongside Micky Yule, Louise Sugden, Olivia Broome and Nathaniel Wilding. The event will contribute towards Tokyo 2020 qualification rankings.